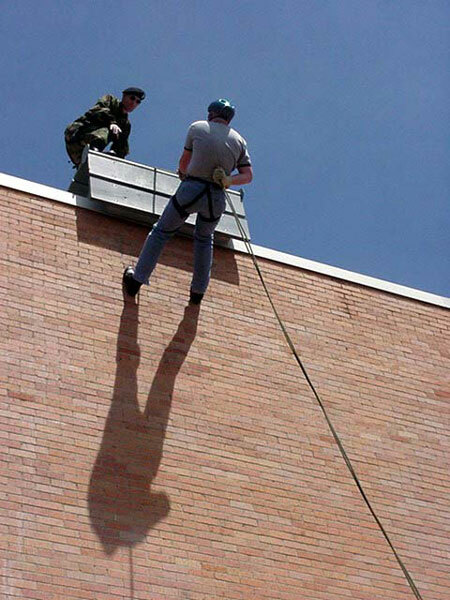 An SHSU student experiences a bit of what Army ROTC is like at the Sam Houston State Bearkat Battalion when he rappels the Farrington Building. Students, faculty and staff of Sam Houston State University, and all others who are interested, are invited to rappel with the military science department Tuesday, April 29, beginning at 9 a.m. The rappeling will take place on top of the Farrington Building. For more information contact Capt. Chris Wooten at the military science department, building AB3, room 309, or call 936.294.3805.